Led Zeppelin will publish an official illustrated book as part of their 50th Anniversary next year. "Led Zeppelin are pleased to announce that Jimmy Page, Robert Plant and John Paul Jones are collaborating with Reel Art Press to publish the official illustrated book celebrating 50 years since the formation of the group,” says the band. “Coming 2018." The news follows recent comments by guitarist Jimmy Page that a number of projects are expected to surface next year to mark the occasion. Formed in London in 1968, Led Zeppelin were inducted into the Rock And Roll Hall Of Fame in 1995 and have sold more than 300 million albums worldwide. 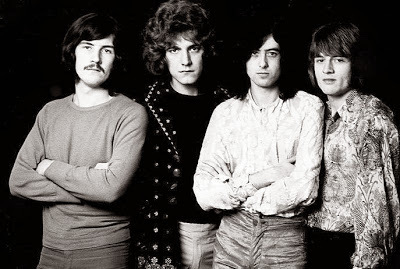 Led Zeppelin reissued their nine studio albums in chronological order in 2014 and 2015, with each project expanded with a companion disc of previously unreleased material; a complete version of their 1997 set, “BBC Sessions”, surfaced last year. Led Zeppelin were named the No. 7 Rock News Artist Of The Year and delivered the No. 8 Rock News Story Of The Year as part of the 2017 hennemusic Rock News Awards.